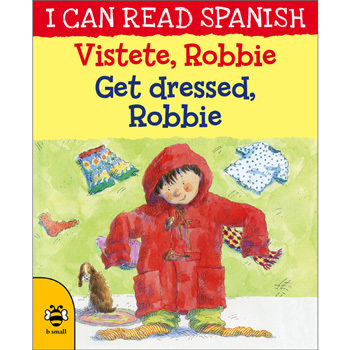 Vístete, Robbie / Get dressed, Robbie is a dual-language book from the I Can Read Spanish series. The books in this series are aimed at young language-learners and use the magic of a beautifully illustrated story together with bilingual text to introduce young children to Spanish in a natural and relaxed way. In this story, Mummy asks Robbie to get dressed but is in for a big surprise when she sees what he's decided to wear! I can read Spanish - Vístete, Robbie / Get dressed, Robbienbsp;is aimed at young learners of Spanish. It includes support for parents with little previous knowledge of Spanish to enable them to enjoy this book with their child.